how do GPS devices find the best route? The GPS maker TomTom was one of the ISMP sponsors (I attended ISMP last week) and they organized a session about optimizing traffic with TomTom speakers. TomTom’s bold Manifesto: When 10% of people drive with TomTom’s HD traffic, roads will flow more efficiently and journey times will be reduced by 5% for everyone. The path to success involves getting estimates of these costs. TomTom has done quite a bit of crowd sourcing. TomTom’s data is stored in Amsterdam, and it grows by a factor of 2-3 per year. They captured almost 8M km this year just in Berlin. They capture >1B travel speeds per day across 50B km of roads. They do find that crowdsourcing cannot be used entirely for generating the road networks. However, all map parameters depend on crowdsourced data or are dynamic. They used to have a constant “speed curve” – average travel speed on a road per hour of day. They now have day and time dependent speed curves that can reflect morning and evening rush hours. These speed curves no longer depend on speed limits. The speed frequencies result in bimodal distributions with one model reflecting typical speeds and the other reflecting speeds of < 4mph (traffic jams!) 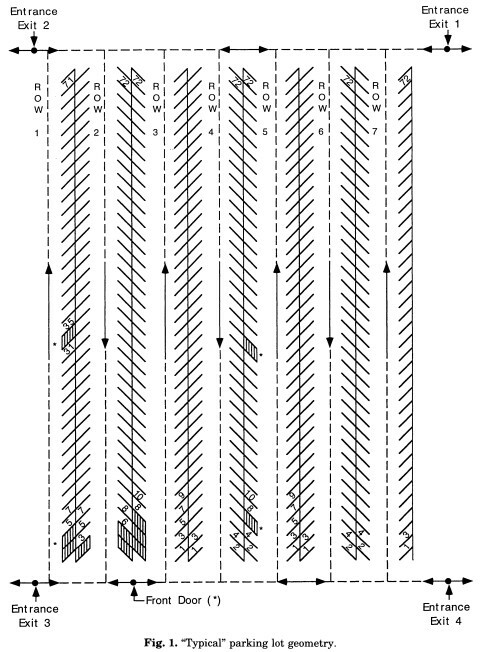 This is all reflected in a network, which is time-expanded (e.g., nodes are intersections AND times of day). The shortest path is thus always changing, since the network changes during a trip. TomTom charges a monthly fee for getting real-time routes, which are mostly used by daily commuters. When there is traffic, TomTom is able to find a new route that is different than the route everyone else takes to get around the traffic jam. This, of course, makes less traffic for the drivers who wait it out in the traffic jam. Thus, drivers following the optimal real-time shortest path make shorter paths for their non-optimal peers (see TomTom’s manifesto above). Coordinating road traffic on the roads (i.e., controlling all traffic rather than directing a single driver) by anticipating the behavior of many drivers is a challenging problem. The price of anarchy is the ratio of the cost of a worst equilibrium to the cost of an optimal solution. The optimal solution in congestion games on a network are optimal for the system, but they are not fair in the sense that some drivers have shorter paths than others. Here the drivers with the longer travel times have an inventive to switch to a shorter route that makes their travel time shorter but slows down the system. To coordinate fairness, they have added fairness constraints and used Stackelberg routing (with a traffic leader who routes a fraction of traffic first that anticipates the selfish behavior of the other drivers). TomTom has found that games with atomic and nonatomic players shows promise for combining coordinated and non-coordinated drivers. Here is an interesting topic: U-turns are incredibly complex and could be a talk in themselves. U-turns could be forbidden (as they are in Malasia), P-shaped (as they are in Michigan? ), and made via roundabout. Unfortunately, U-turns were not discussed much. Please leave your complex U-turn experiences in a comment. Here is another interesting topic: one of the speakers gave an example of the single hour that traffic is the worst on the road outside the conference. It was Tuesdays from 5-6pm. I travel home from work during this hour in Richmond, Virginia (USA), and have noticed that the congestion at the main interstate exchange is worst on Tuesdays at this same time (measured in how long the line is for I-95 N coming from I-195). The speaker did not elaborate, but I am curious is Tuesdays from 5-6pm is a bad hour everywhere. Do you use a GPS for your daily commute? How has it changed your routes? Yesterday, Peter K. requested that I put the US driving safety statistics in an international perspective. Here are four figures on this topic. The driving fatality rates in the EU by region. These rates include fatalities caused by driving, and therefore, pedestrians killed by cars are included. “The total road death toll was cut by 48 % between 1991 and 2008 and has fallen by 31 % since the year 2000.” Eastern Europe looks kinda dangerous here, and Italy doesn’t live up to its dangerous driving reputation. 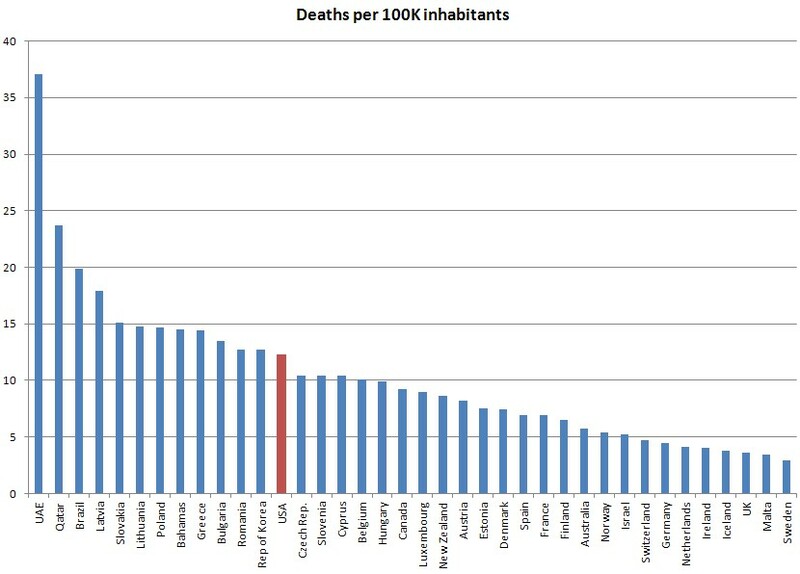 Here are the traffic fatalities per 100K inhabitants. Only about half of the people who died were in cars, although I suspect that less developed countries contributed to more pedestrian deaths. Here are the traffic fatalities per 100M miles driven. 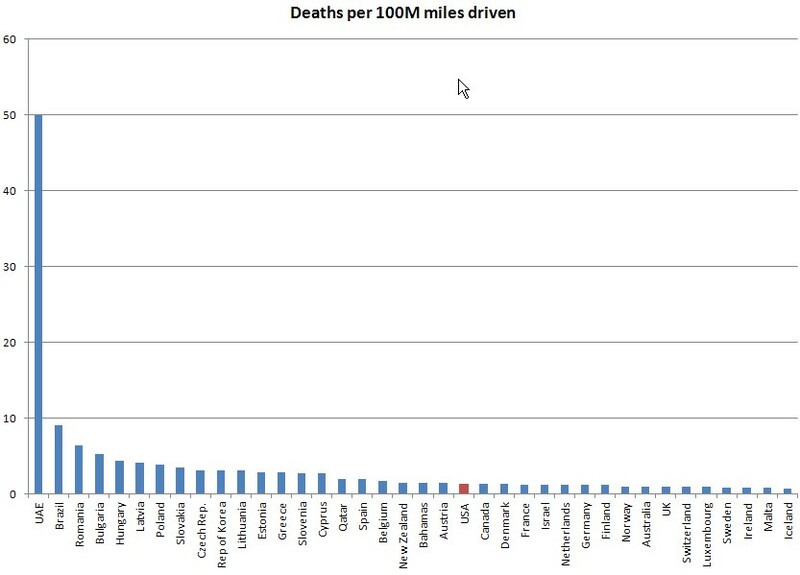 The last figure didn’t normalize the fatalities according to how much people drive in different countries. This figure, on the other hand, better reflects how good the drivers are in different countries. However, countries with high speed limits (think of the Autobahn) may fare a little worse, since accidents at high speeds tend more be more deadly. Again, half of the victims were not in cars. Therefore, you might not want to be a pedestrian in UAE. This is my favorite figure. Here I tested whether people who drove more got more practice, and therefore, led to safer driving conditions in their countries, a possible upside to driving a lot [link to data from the EU countries]. 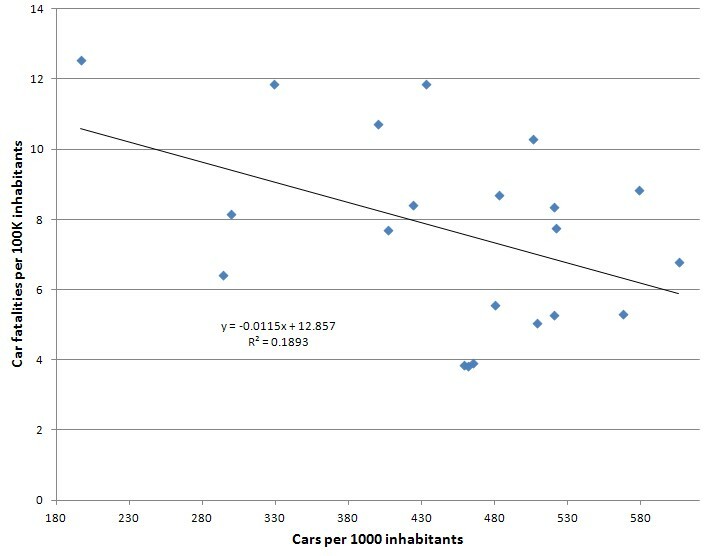 The x-axis shows the number of cars per 1000 inhabitants, a proxy for how much people drove (This isn’t perfect, but I couldn’t find the actual number of miles driven). The y-axis has per capita car fatality rates (per 100K). There is certainly a negative relationship here, with more cars associated with fewer fatalities. However, this only explains ~19% of the variation. My post yesterday on why teenagers don’t have drivers licenses continues to generate discussion (thank you readers!). I’m going to continue the discussion here. Despite the poor economy and expensive gas, Americans still love their cars. This love goes way, way back to the invention of cars (see my other blog post on super-highways). Here are some other interesting figures about Americans and their cars. 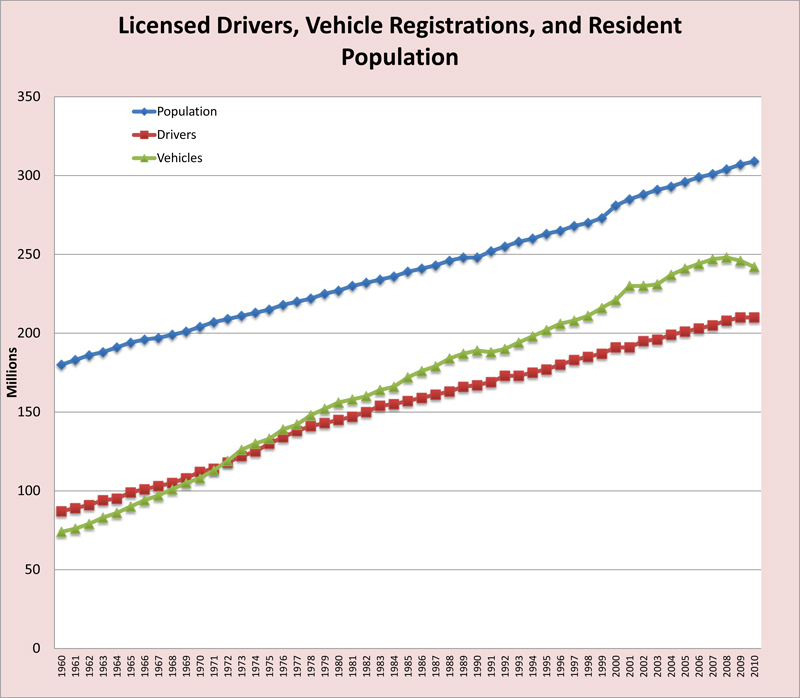 There are more cars than licenses drivers in the US. This is not a recent trend: there have been more cars than drivers since 1971. This gap is getting smaller, but it’s still wide, historically speaking. My husband pointed out that commercial and government vehicles may be included here. Another report shows that cars outnumbered drivers c. 2000. This figure shows the miles of road (red). More recently, the total number of lane-miles (green) are shown, which takes multi-lane roads into account. This is a bit misleading, since adding a second lane does not double the road capacity. Compare the total number of road-miles to the total number of miles driven (blue). This suggests that there may be a road shortage. However, building more roads only encourages people to drive even more. Still, Americans love to drive more than ever. 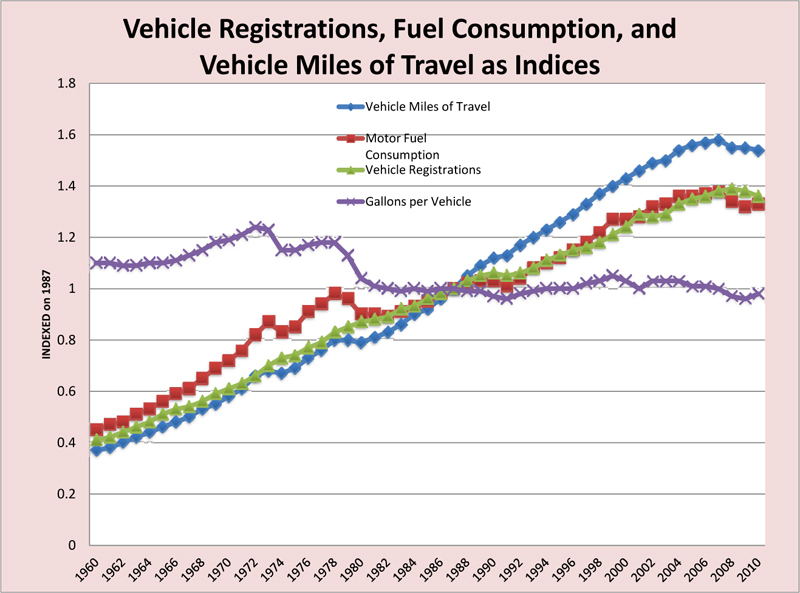 The average annual number of miles driven per driver has steadily increased over time. Only recently people have been cutting back on their mileage, probably due to a poor economy and expensive gas. However, we have only cut back to our 1998 driving level. Look at the purple line here. This is the average mpg relative to 1987 cars (the 1.0 level), and low is good. 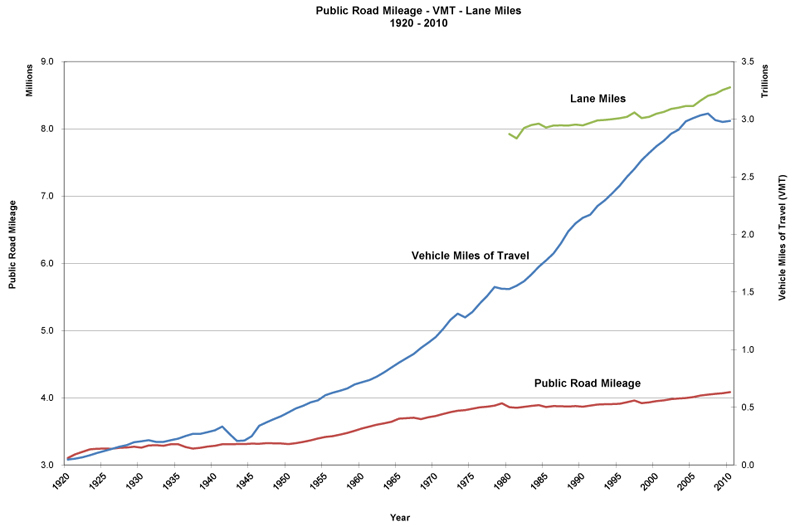 This shows that the average mpg has been more or less constant since 1980. This is largely because of the growing popularity of SUVs and minivans. We’ll have to see if the trend of tiny cars and Cash For Clunkers improves these values in the future. Car, light truck (read: SUVs) and motorcycle fatalities per mile driven. This should convince you not to get around by motorcycle! You cannot see the car fatalities rates well. The fatality rate on rural rates is more than twice as large as the fatality rate on urban roads. This is probably due to urban congestion (congestion = slow driving = safer accidents) and the danger surrounding 2-lane rural highways (2-lane highways = head on collisions at high speeds). Both rural and urban fatality rates have come way down since 1980, probably due to air bags and other safety features (and despite of road rage). The urban fatality rate has dropped faster than the rural fatality rate. Again I would suspect urban congestion here. This is the upside to traffic. Takeaway: Driving is safer than ever.